With a seat width of 28.5 inches, and a weight rating of 500 lbs., the Jordan Bariatric Recliners provide the scale, strength and mobility to accommodate larger patients and guests. Heavy-duty locking casters enable these patients to be safely moved. The mechanism provides four positions, and an optional (and additional) lay-flat position can also be specified. Special foam has been used to provide additional support and durability on this product. Bariatric furniture is subject to very intensive use. 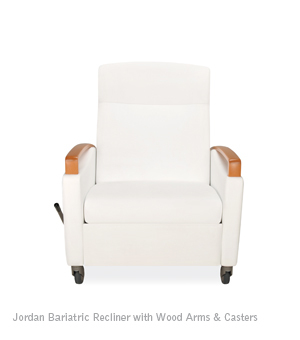 Jordan Bariatric Recliners are made with heavy-duty materials and components, but should they become damaged or degraded, individual components can be replaced (including the mechanism), and the product can be specified with replaceable upholstery covers.